This archive holds all posts form July 14, 2009. 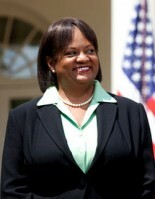 President Obama has just nominated Dr. Regina Benjamin to the post of Surgeon General, the AP reported yesterday. Obama said that Dr. Benjamin “has seen in a very personal way what is broken about our health care system” and that she will bring important insight as his administration tries to revamp that system. Dr. Benjamin truly has seen her fair share of personal and family tragedy, as her brother died at age 34 of HIV-AIDS, her mother of lung cancer, and her father of complications resulting from diabetes. With her entire family victimized by these diseases, her life is a testament to the health problems facing this country and the racial injustices plaguing the Black community. She has faced lots of other tragedy, as her medical clinic was destroyed by Hurricane Katrina and again by a fire just after it was rebuilt. She then rebuilt this very important New Orleans clinic yet again. (Photo: Wikipedia) Not surprisingly, the right-wing press is again mocking President Obama’s well-qualified nominee. A Fox News headline reads, “Obama Taps ‘Genius’ Doctor, Katrina Victim for Surgeon General,” an obtuse reference to a $500,000 MacArthur Foundation award she received for her dedicated and selfless service following Hurricane Katrina. Dr. Benjamin is receiving some gendered-racist attacks like Obama’s Supreme Court nominee Sonia Sotomayor has gotten the last few days, with some right-wing (like Senator Jeff Sessions, famous for his “joking” comments about the nice folks at the KKK) attacks on her “wise Latina” comments. Dr. Benjamin attended Xavier University of Louisiana in New Orleans and was a member of the second class of the Morehouse School of Medicine. She received her M.D. degree from the University of Alabama at Birmingham. . . Benjamin is former associate dean for rural health at the University of South Alabama’s College of Medicine in Mobile, where she administers the Alabama AHEC program and previously directed its Telemedicine Program. She serves as the current president of the Medical Association of the State of Alabama. In 1995 she was elected to the American Medical Association’s board of trustees, making her the first physician under age 40 and the first African-American woman to be elected. Benjamin is a diplomate of the American Board of Family Practice and a Fellow of the American Academy of Family Physicians. She was a Kellogg National Fellow and also a Rockefeller Next Generation Leader. She has served on a variety of boards and committees, including the Kaiser Commission on Medicaid and the Uninsured, Catholic Health East, Medical Association of the State of Alabama, Alabama Board of Medical Examiners, Alabama State Committee of Public Health, Mobile County Medical Society, Alabama Rural Health Association, Leadership Alabama, Mobile Area Red Cross, Mercy Medical, Mobile Chamber of Commerce, United Way of Mobile, and Deep South Girl Scout Council. She was appointed by the U.S. Department of Health and Human Services Secretary Donna Shalala to the Clinical Laboratory Improvement Act Committee and to the Council of Graduate Medical Education. . . .In Alabama, she formerly served as vice president of the Governor’s Commission on Aging, and also formerly as a member of the Governor’s Health Care Reform Task Force and the Governor’s Task Force on Children’s Health. . . . Dr. Benjamin was named by Time Magazine as one of the “Nation’s 50 Future Leaders Age 40 and Under.” She . . . was chosen “Person of the Week” by ABC’s World News Tonight with Peter Jennings, “Woman of the Year” by CBS This Morning, and “Woman of the Year” by People Magazine. Wow! Can any of her critics come close to matching this remarkable list of achievements? Talk about having to be the proverbial “water walker” to get nominated for high office. In discussing this nomination with Adia, we agree with her view that it is often the case that people of color, and certainly women of color, are told to work hard and play by the societal rules. But when they, like Dr. Benjamin and Judge Sotomayor, do that extremely well and then seek out or get nominated for nontraditional jobs not open to them until recently in U.S. history, or when they literally shatter the conventional glass ceilings, certain white racist folks, talk show hosts, and politicians start articulating racist stereotypes and narratives and engage in name-calling, like the calling of Dr. Benjamin as “fat” and racist commentaries, including racist epithets, on various news and right-wing websites. Instead, why isn’t the right celebrating them for doing exactly what they were told, working very hard and achieving great things? One would think these women would be celebrated in all corners of conservative America? Is the reason they are not because that work-hard rhetoric is really a ruse and cover often used to rationalize a racist system that has little or no attention of changing its basic structure for those who more than meet the calls of this work rhetoric? While being overweight is a health concern that Dr. Benjamin and others in the health field are likely very aware of, why is it that none of these right-wing folks talk about how fat Justice Antonin Scalia is, or Karl Rove, or the huge Rush Limbaugh in regard to their “qualifications”? Indeed, we have not seen anyone suggest that these white men’s overweightness interferes with their ability to do their jobs. Yet, for women of color like Benjamin, this immediate accent on their being overweight is a common gendered/racial stereotype that seems to be linked to the old black “mammy” image, which is part of the 400 year old white racial frame.